Technology is advancing faster than ever, so it’s no wonder that smartphones become smarter by the day, incorporating more features and technologies than we could have ever imagined a few years ago. The funny thing is that, despite this fact, one of the main uses for these devices is gaming. Apple iPhone, iPad and iPod Touch devices may be innovative products that set new standards in the world of gadgets, but that thing doesn't stop gaming lover geeks to use Smartphones and tablets as high-tech gaming console. And if you’re going to play games, at least make sure you play the good ones. Here’s you will get list of iOS Games you shouldn't miss with the Review of Top 10 Best Must-Have Free iOS Games for iPhone, iPad and iPod Touch. If the title of this game sounds crazy, well, that’s because the whole idea of the game is a bit off track. You’re basically dealing with a game of Jenga. Well, except you don’t play with wooden blocks but with cartoonish apartment buildings. And instead of removing “blocks”, you have monsters eating them or destroying them. It’s all a bit mess, actually, but it’s a fun mess, which you should definitely try. Download & Install Super Monsters Ate My Condo from HERE! Ever wondered what happens behind the scenes in a train yard? How do all the trains get from one track to another, finding their ways to the right track, and to the station? This game is going to give you some answers on this matter by putting you in charge of creating tracks so that different color-coded trains can get to their appropriate depots. It gets a lot more interesting when tracks are crossing each other, as you’ll have to be extra careful so the trains don’t crash into each other. Download & Install Trainyard Express from HERE! Trace is a very simple yet very fun game, and it’s no coincidence that the game’s graphics look like the whole game was drawn in Microsoft Paint, because that’s one of the key aspects in the Game: drawing. You’ll have to hand-draw map elements so your character can move safely around various obstacles. Basically, you’re designing the game yourself. Does that sound fun or what? Download & Install Trace from HERE! What happens when you combine a shooter game with a role-playing game? You get Solomon’s Keep, a game that will look quite familiar if you ever played Diablo on your PC. If you haven’t, well, the game is all about fighting hordes of enemies using magic. Find your way around the surprisingly big map, collect items and become more powerful, all on your way to meet Solomon himself. Do you have what it takes to win the ultimate battle? Download & Install Solomon’s Keep from HERE! Are you a fan of pool? You’ll love bankshot! The game combines pool and air hockey, into a game where the goal is to get the puck to the destination by hitting at least one wall in the process. Watch out, though, as your puck can only hit the walls a limited number of times before you lose. Bankshot is a great game to test your geometry skills. Download & Install Bankshot from HERE! Bam Bam Dash has you guiding an ever-running caveman to his destination, keeping him from plunging down a cliff or getting eaten by some not-so-friendly prehistoric beasts. The game is simple and fun – perfect for a boring afternoon. Download & Install Bam Bam Dash from HERE! If your job has anything do to with computers whatsoever, chances are you’re quite familiar with the famous card game known as Solitaire, as it’s the most common means of procrastination in offices all around the world. Sol Free Solitaire is basically the same thing, now available for free on your iPhone and iPad, so you can enjoy a quick game of cards no matter where you’re at. Download & Install Sol Free Solitaire from HERE! If you thought drawing contests are for the kids, you’ve clearly never played Draw Something Free. The game is a multiplayer turn game which requires you to pick a friend to play against, and then take turns into drawing something while the other has to guess what it is. Since neither of you is no Picasso, the game is going to be tons of fun. Download & Install Draw Something Free from HERE! Fan of Indiana Jones? Temple Run is your game! Run around ancient temples collecting artifacts, and watch out for those mysterious enemies that will try to stop you at any price. Are you up for the challenge? Download & Install Temple Run from HERE! Your dog would totally love this game, but that doesn’t mean you won’t love it too. You’re in control of a Frisbee disk, the aim being to find your way through an environment filled with obstacles. Who said Frisbees can’t be fun? Download & Install Frisbee Forever from HERE! 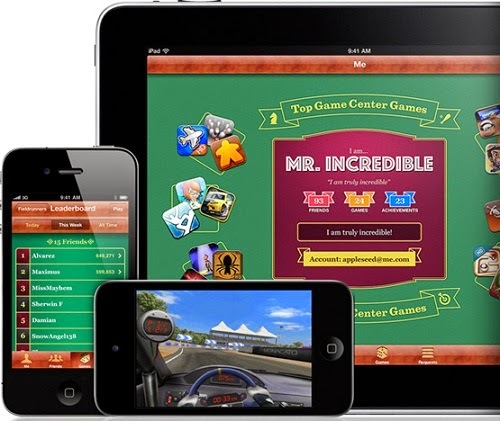 You can find and play more free games as per your interest from iTunes game center too.